Find bellow the editorial that introduce this special issue. More than thirty studies containing data on 1390 patients with various malignancies (544 with head neck cancer, 153 with ovarian cancer, 260 with breast cancer, 118 with lung cancer, 147 with leukemia and lymphoma, 129 with sarcoma, 19 with genitourinary cancer, and 20 with central nervous system cancers) have been presented during the meeting. The 12 abstracts in head neck cancer document the combined experience in a total of 544 patients. If we exclude the 15 patients treated with weekly paclitaxel and carboplatin, it still is a collective data on 516 cases. The most common metronomic therapy combination used was methotrexate and celecoxib, drugs that are easily available and inexpensive. One study of 13 patients included the addition of erlotinib as the third drug. We would like to comment on two specific studies. Abstract No. 3 by Agarwala et al. involving sixty patients clearly shows that conventional standard systemic therapy (paclitaxel plus cetuximab) is significantly better than oral metronomic therapy (OMT). These data indicate that OMT should not be used if the patient is able to receive standard of care. Abstract No. 8 by Chandrakanth et al. compared quality of life (QoL) in patients receiving OMT versus weekly cisplatin. These results clearly show that QoL is same in both the arms. What is most interesting is the data of 110 patients reported by Patil et al. This impressive prospective randomized study showed that both overall survival (OS) and progression-free survival (PFS) was better with OMT as compared to weekly paclitaxel, with a P = 0.02. Moreover, this was achieved with fewer adverse events as well. Such comparison has also been made between OMT and weekly cisplatin. This is the most impressive data that we have seen in favor of OMT so far. The three abstracts on ovarian cancer used etoposide, cyclophosphamide, tamoxifen, erlotinib, and/or celecoxib as agents for OMT. These data need cautious interpretation. Clearly in the neoadjuvant setting, the standard therapy of paclitaxel and platinum gave a response rate of almost 100% (34/35 cases) and better median PFS as reported by Pandey et al. In heavily pretreated patients, the value of OMT is in providing an OS of 7 months as shown by Kalaichelvi et al. Gupta et al. have shown that use of etoposide, cyclophosphamide, and tamoxifen is not without significant adverse events, with more than half the patients requiring dose reduction. The value of this strategy, however, was in obtaining an overall response rate (ORR) of 76%. The data on 260 women with breast cancer from rural India by Khatwani et al. show that there is a lot of scope for improvement. If an ORR of 25% can be obtained in metastatic triple negative breast cancer for the subset who had failed previous therapy with standard therapy, use of oral cyclophosphamide and methotrexate could be a valuable option, especially in the low- and medium-resource setting. In fact, the most interesting adjuvant trials are the ABCDE trial (NCT00925652) where two of the four arms receive metronomic cyclophosphamide with bevacizumab (plus diet intervention ± exercise), the SYSUCC-001 trial (NCT01112826) in TNBC patients where the intervention group receive 1 year of metronomic capecitabine, and the IBCSG 22-00 trial (NCT00022516) using cyclophosphamide-methotrexate maintenance after standard adjuvant therapy in hormone receptor negative patients. The data on 139 patients with acute myeloid leukemia by Singh et al. indicate that there could be potential benefit from maintenance therapy, especially if it can contribute to achieving an OS of 69% at 5.7 years. Among patients with sarcoma, the drugs used as OMT included tamoxifen, etoposide, cyclophosphamide, propranolol, vinblastine, and methotrexate. An ORR of 59% in the study by Kumar et al. in the setting of refractory, relapsed and metastatic sarcoma shows the potential of this approach. More than a decade ago, the 2 teams of R. Kerbel and J.Folkman independently published about the antiangiogenic effects of low-dose chemotherapy a strategy that was subsequently made popular as metronomic chemotherapy. Kerbel and Kamen also show that OMT is likely to have more than the usually recognized antiangiogenic effect. This includes, but is not limited to, targeting endothelial cells of the tumor neovasculature; inhibiting mobilization or directly targeting proangiogenic bone marrow-derived cells; suppressing hypoxia-inducible factor1-apha; direct action against cancer stem cells and indirect action via stimulating the immune system. 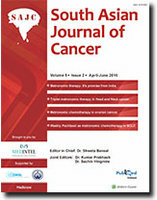 Medline search "metronomic chemotherapy India" yielded 31 references, 17 of which are involving the Department of Medical Oncology, Tata Memorial Hospital, Mumbai (http://www.nlm.nih.gov/). Hence, it is not surprising that the international community awarded the first Barton Kamen-MGHI Prize to Prof. Shripad Banavali in 2014. This prize was given by the wife of the late Dr. Barton Kamen, a pediatric oncologist, who pioneered low-dose chemotherapy and was an untiring advocate of metronomic chemotherapy. By bringing out an issue of the Indian Journal of Cancer on metronomic therapy in 2013, India led the initiative instead of simply copy-pasting so-called standard-of-care from the western world. Moreover, by hosting the international metronomic conference in Mumbai, India, this year (which is the next logical step), India is cementing its leadership role in this field. It is now time for various thought leaders, think tanks, governments, pharmaceuticals companies, and international NGOs to join hands to initiate a global strategy and program to systematically study, document, define, and embed the exact place of metronomic chemotherapy in the armamentarium against cancer. Incorporating strategies to design metronomic chemotherapy trial, with biomarkers and reliable surrogate markers of clinical benefit, will enable oncologists to optimize its value in the current era of personalized medicine.